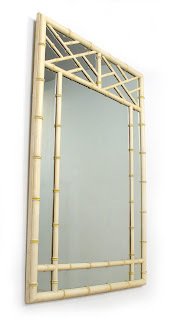 What is it about bamboo? Recently I have been nursing an increasing obsession with the style. 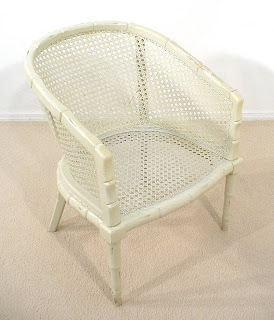 Whether it is a chippendale-esque bamboo (like above) or a hollywood regency bamboo (as you have seen in many “lusting to lacquer” posts) I just cannot get enough of the stuff. 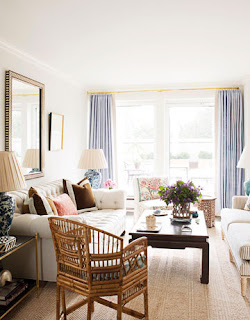 I love all the different colors that it comes in, because it can really bring a lot of warmth to a room. This bamboo secretary has such a great mottled appearance which gives it so much depth. These marble-topped faux bamboo dressers are quite common, and I really liked the distressed quality of the mirror above. It has a very british colonial look. I love the simple quality of this vignette–straightforward and uncluttered, and the pop of color from the vase full of flowers. 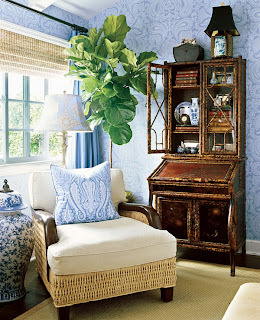 Bamboo patterns are not just for furniture. 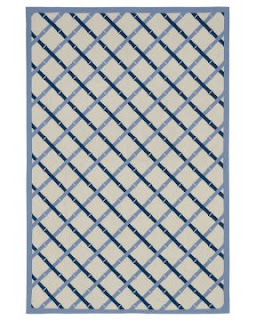 This needlepoint rug, from Williams Sonoma Home would be a great edition to a room. Unfortunately for me, the price starts at $1295, so its a little out of my budget. I have some of these at home, these are from Amazon.com and are just $9.95. 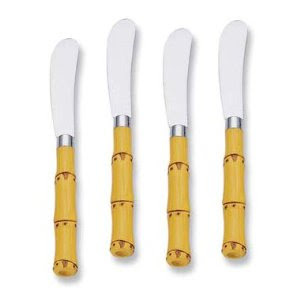 This way you can add a little bamboo flair to all your hors d’oeuvres. 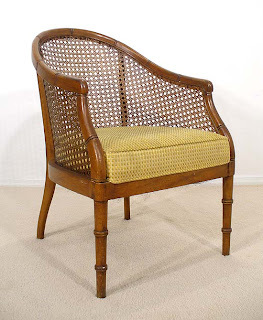 I just love this chippendale inspired armchair from Ballard Designs. It is cheaper than the Jonathan Adler version, coming in at $295. If that is a little expensive for you, do some searches on Craigslist or EBay using “chippendale” as your keyword. I’m sure you will be successful. 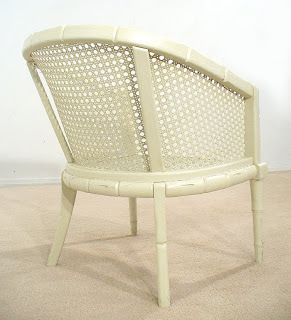 These are some of the hollywood regency style bamboo inspired pieces that I found on EBay this week, all under $100. Obviously I am lusting to lacquer all of these pieces in more contemporary colors. 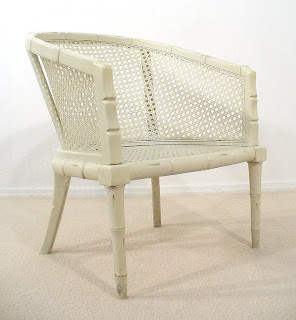 Save the dark wood cane/bamboo chair, I like the color, it just needs a new cushion. Aren’t these great? I just love EBay and all the yummy things that you can find, its easy! Voila! Here is the chair that I decided to buy. I love the cane, which is in really good condition, the hollywood regency style bamboo, and the ability to have my own cushion made. Obviously this thing is getting lacquered within an inch of its life. I would love to hear some suggestions from my readers: colors to lacquer? Fabrics for the cushion? I love this chair because the possibilities are absolutely endless. 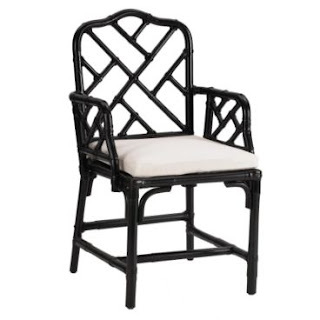 I am so excited because I have wanted a chair like this for such a long time! 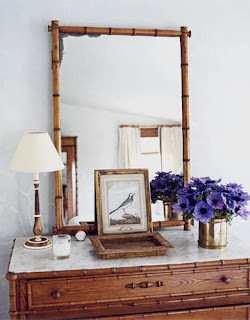 I am pretty obsessed with bamboo, whether it be pretty mirrors or Adler-inspired chairs. 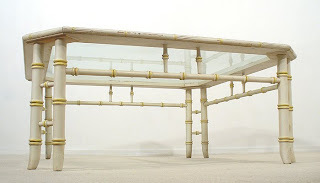 Bamboo is timelss, yet modern. Where are you putting this chair?